Voluntourism is fast becoming a popular phrase for those looking to dedicate both their time and funds towards something meaningful. This has however erupted with a growing number of companies and organisations claiming to offer genuine ecotourism experiences that are doing more harm than good – especially within the wildlife conservation sector. 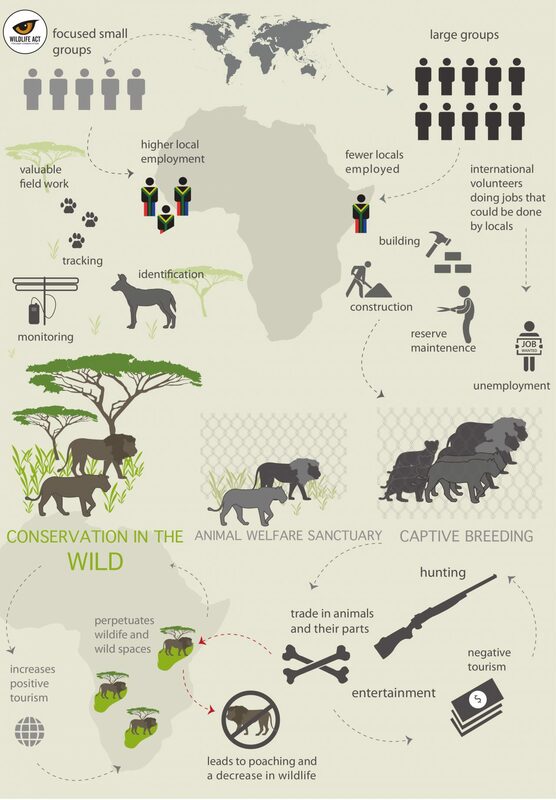 Our infographic below provides a good visual guide explaining the good, the bad, and the ugly with regards to voluntourism and wildlife conservation. We would like to offer a thorough breakdown of what this encompasses. Keeping groups small and focused is an essential component of sustainable wildlife voluntourism that provides genuine benefit to the work that needs doing. Small groups allow direct involvement with important conservation tasks and allow volunteers to work side-by-side with experienced wildlife monitors. There is no point in leaving volunteers with nothing to contribute. Wildlife ACT’s model of responsible tourism allows no more than five volunteers per reserve at any given time. This is unlike other voluntourism projects that are essentially glorified safaris, whereby up to 10 people get on one vehicle and as many as 30 volunteers on one private reserve. Many wildlife conservation volunteer programmes with large groups detract from local employment. South Africa has an extremely high rate of unemployment. Within protected wildlife reserves, unemployment within local communities is the major cause of wildlife poaching. Conservation efforts often neglect to take the social impact of local communities into account. It is our belief that conservation is only sustainable if the local community benefits from conservation and the natural heritage that surrounds them. Wildlife ACT works to provide jobs within the conservation sector, by training aspirant local community members to enter the conservation field. Our company policy is to only employ African Nationals, especially in the role of our wildlife monitors who interact with ecotourists, thereby providing local job creation. Furthermore, none of our volunteer work detracts from local employment in the wildlife or reserve sector. Wildlife ACT has been campaigning alongside Blood Lions since they first released their hard-hitting documentary about the canned lion hunting industry in South Africa. Breeding wild cats in ‘sanctuaries’ is NOT conservation, and in many cases, fuels trophy hunting and the trade in animal parts. Wildlife ACT believes that wildlife conservation is about conserving wild animals in their natural habitats, and is strictly against interactions with wild animals unless absolutely necessary. Thorough research is essential when choosing to volunteer with wildlife. Have they been vetted? What conservation authorities are they partnered with? What are past ecotourists saying about them and what is their reputation online look like? Wildlife ACT is the only Fair Trade Tourism certified wildlife volunteer programme in Africa that works with and are supported by high-profile and international conservation organizations such as WWF, the Endangered Wildlife Trust, Panthera and Wildlands Conservation Trust (to name just a few). We are also extremely honoured to have been awarded with both a World Responsible Tourism award and an African Responsible Tourism award in the category “Best for Habitat & Species Conservation” – an event that promotes and supports responsible travel.